Described as the first of Nokia's new generation of smartphones available in India within price tag of Rs15,500 it's good bargain. About a year Nokia left the Symbian OS and adopted to new Microsoft’s new operating system learnt to be as Windows Phone 7. 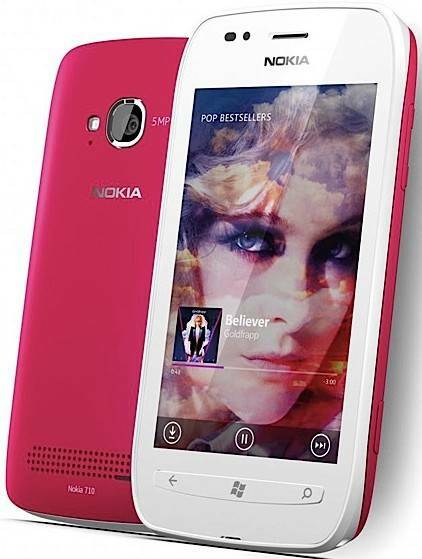 The amalgamation of Nokia Lumia 710 and Windows Phone 7 resulted as sales of the device for the counter sales. It is a modest device in comparison to jumbo-sized screens and elegant static design. It is as same size and shape as Apple’s iPhone 3GS. The phone only has a single-core processor, with 512 megabytes of memory, just 8 gigabytes of storage and it is without memory card slot that would allow users to add to its storage. By comparison, the latest Android smartphones have dual and even quad-core processors and the iPhone 4S has as much as 64-gigabytes of storage capacity. Its battery charge runs for full day. The limited storage capacity of the phone restricts the amount of music, movies and documents to be enjoyed over it. But this limitation is further added by the additional 25 gigabytes of storage Microsoft offers Windows Phone 7 users on its servers in the cloud. Users can automatically store Office documents to the so-called SkyDrive and can have their pictures and videos automatically uploaded to it. The best point of the Lumia 710 is the Windows Phone 7 software. In comparison Android, Windows Phone 7 has better visual appeal and it is an intuitive operating system. The Windows 7 has the exceptional feature of the software is its built-in Bing search application, which let to search scan bar codes, identify music, find local events and search the Web and local business at the same period.